Spinach-gruyere strata is a lot like lasagna–it has a lot of parts that have to be prepared, put together, then baked. This is a recipe where you don’t want to substitute something else for the Gruyere cheese, use onions instead of shallots, or leave out the wine. The amazing flavor is worth going out of your way to buy ingredients that you might not otherwise use. Click here for a quick link to our recipe index. Plan ahead for this step. It does take a while to dry the frozen spinach enough so the strata doesn’t come out runny. You can either thaw the spinach in the microwave or just leave it out for most of a day at room temperature. Put the spinach in a large strainer over an empty bowl. Use the back of a large spoon to press out the extra liquid. Once you’ve put the strata together, cover it tightly with plastic wrap. Place another baking dish on top of the plastic. I use large cans of tomatoes to press the baking dish into the strata. It really makes a difference to make sure the top layer of bread is completely saturated with the custard. Otherwise, the top bread pieces stay too dry and crusty. You want the top to be moist enough it just makes a light crust on the top with the cheese. This recipe can easily be doubled or tripled for a large crowd. For a double recipe, use a 9 x 13 baking dish. For a triple recipe, use an 11 x 17 baking dish. Remember to add more time for baking larger batches. Adjust oven rack to middle position and heat oven to 225 degrees. Arrange bread in single layer on large baking sheet and bake until dry and crisp, about 40 minutes, turning slices over halfway through drying time. (Alternatively, leave slices out overnight to dry.) When cooled, butter slices on one side with 2 tablespoons butter; set aside. Heat 2 (4/6) tablespoons butter in medium nonstick skillet over medium heat. Saute shallots until fragrant and translucent, about 3 minutes; add spinach and salt and pepper to taste and cook, stirring occasionally, until combined, about 2 minutes. Transfer to medium bowl; set aside. Add wine to skillet, increase heat to medium-high and simmer until reduced to 1/4 cup; set aside. Butter baking dish with remaining butter; arrange half of buttered bread slices, buttered side up, in single layer in dish. Sprinkle half of spinach mixture, then 1/2 cup of grated cheese evenly over bread slices. Arrange remaining bread slices in single layer over cheese; sprinkle remaining spinach mixture and another 1/2 cup of cheese evenly over bread. Whisk eggs in medium bowl until combined; whisk in reduced wine, half-and-half, 1 teaspoon salt, and pepper to taste. Pour egg mixture evenly over bread layers; cover surface flush with plastic wrap, weigh down, and refrigerate at least one hour or up to overnight. (Weighing down presses the bread into the egg mixture, making sure all the bread gets soaked and stays moist while baking rather than drying out. To do this, place another baking dish on top of the plastic wrap and place several heavy cans on top until the cream mixture comes to the top of the bread). Remove dish from refrigerator and let stand at room temperature 20 minutes. Meanwhile, adjust oven rack to middle position and heat oven to 325 degrees. Uncover strata and sprinkle remaining cheese evenly over the surface; bake until both edges and center are puffed and edges have pulled away slightly from sides of dish, 50 to 55 minutes (or about 60 minutes for doubled recipe). Cool on wire rack 5 minutes; serve. This recipe for Spinach Gruyere Strata with is a lot like lasagna–lots of parts that then get put together and baked–but it is SO worth it! 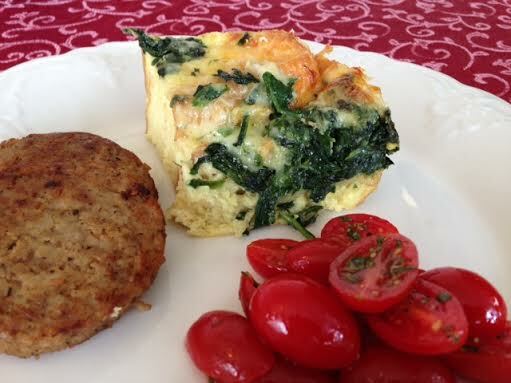 The aroma as it’s baking is divine, and it’s fabulous for a brunch or holiday breakfast. Note that you can make a small batch or one that feeds up to 18 people. The leftovers re-heat nicely in the microwave. 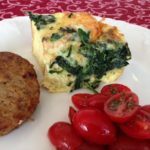 You can make this well in advance, bake, pair with some sausage or muffins, and breakfast for a crowd is ready. Tip: thaw the spinach completely in a colander in a bowl; then use a salad spinner to get out the remaining moisture. Adjust oven rack to middle position and heat oven to 225 degrees. Arrange bread in single layer on large baking sheet and bake until dry and crisp, about 40 minutes, turning slices over halfway through drying time. (Alternatively, leave slices out overnight to dry.) When cooled, butter slices on one side with 2 (4/6) tablespoons butter; set aside. Heat 2 (4/6) tablespoons butter in medium nonstick skillet over medium heat. Saute shallots until fragrant and translucent, about 3 minutes; add spinach and salt and pepper to taste and cook, stirring occasionally, until combined, about 2 minutes. Transfer to medium bowl; set aside. Add wine to skillet, increase heat to medium-high and simmer until reduced to 1/4 cup (1/2 cup/3/4 cup); set aside. Remove dish from refrigerator and let stand at room temperature 20 minutes. Meanwhile, adjust oven rack to middle position and heat oven to 325 degrees. Uncover strata and sprinkle remaining cheese evenly over the surface; bake until both edges and center are puffed and edges have pulled away slightly from sides of dish, 50 to 55 minutes (or about 60 minutes for doubled recipe). Cool on wire rack 5 minutes; serve.